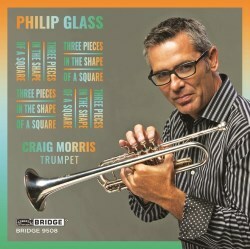 The prospect of over 50 minutes of solo trumpet music might not immediately entice, but the first thing that strikes you about this recording is the mellifluous tone that Craig Morris has. Recorded in a generous acoustic, this is a sound you can live with and revel in – with a light vibrato and expressive phrasing as well as variety in tone and impact. Gradus comes from the beginning of Glass’s career, using the rhythms which attracted him to Indian music. Extended development of these rhythms and the use of few notes that create a slow harmonic evolution over time are more familiar to fans of Glass, though their expression in a solo instrument creates its own intensity. If you know anything about campanology this might be compared to change ringing, and the subtleties of variation in Gradus certainly have a similar feel. Whatever anyone says this is likely to seem a bit of a niche programme at first glance, but I’ve enjoyed it hugely and would recommend it to anyone with a mood to explore. A nice touch is that the release coincides with the 50th anniversary of the September 1968 concert at the Film-Makers Cinematheque that was in part responsible for launching Philip Glass’s enduring and highly successful career.